Booed into the dugout at his first game and unwelcoming graffiti on the walls of the Goldstone, Steve Gritt had a lot to do to win over Albion fans after taking over as manager of the Seagulls in December, 1996. With the club 11 points from safety at the bottom of the Football League, things looked bleak. Gritt had taken over from a Seagulls fans’ favourite in Jimmy Case and was not a popular appointment with fans. Despite tensions at the club high and a number of off-field issues, from the moment he walked through the door, Gritt said he was solely focused on football. 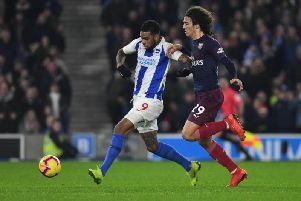 After an unusual first match, a 3-0 win at home to Hull City, with Albion fans blowing whistles and one supporter chaining himself to the goalpost at half-time, Gritt’s popularity slowly but surely started to grow among Brighton fans. Gritt never lost a game at the Goldstone – winning ten and drawing two of his 12 home matches – and went on to seal the club’s survival in the Football League when they drew 1-1 at Hereford in the final game of the season. He is still remembered fondly by the club’s fans, who are grateful the now 59-year-old kept the Seagulls in the league. Recalling taking charge of Brighton, having been out of work for 19 months after his role as joint manager of Charlton ended, Gritt said: “The place was in turmoil, really. The club was struggling at the time but it just amazed me that the squad weren’t better and higher up the league because of the quality they had. Remembering his first game, Gritt said: “The fans were blowing whistles and booing me as I think I was perceived as a puppet for the chairman and the chief executive at the time. I probably also wasn’t a big-name person coming into the club to take over the team. “But from day one, I maintained I was only there for the football. I’d been out of work for a while, I wanted to get back into the game and this was an opportunity for me. “With that, the game started great. We went 1-0 up inside about five minutes against Hull and I think we were 2-0 up at half-time and suddenly someone has chained themself to the goal post. It was a pretty unusual first game and a pretty unusual introduction at the club, but thankfully we unchained the guy, managed to win the game and, within a stroke, we’d cut the deficit down to eight points. Gritt always thought survival was a possibility with the squad he inherited and highlights of his time at the Goldstone included support from all around Europe, especially Charlton supporters, for Fans’ United, a 5-0 win against Hartlepool, and the 1-0 victory in the final game at the Goldstone, before the do-or-die final match at Hereford the following week. A 1-1 draw, thanks to Robbie Reinelt’s second-half equaliser, kept Albion in the league. Gritt said: “To come back showed the character the players had shown over that second half of the season. It epitomised what they’d been about for me and what they had done to turn everything around. Thankfully, that result went Albion’s way but had Gritt thought about what defeat would mean for the club? He said: “I hadn’t even thought about what was going to happen after the game with me, with the club, with anything. Everything was concentrated into that half a season, the final few games and that final game. We would have looked at everything afterwards whatever had happened. Gritt was sacked in February, 1998, with Albion second from bottom but he remembers his time at Brighton fondly and said: “I’m continuingly reminded about it every time I see or come across a Brighton supporter. They’ll always shake my hand and are very good to me and I’m always very grateful for that. “I remember my time there very fondly but with a tinge of regret that the second season didn’t pan out as I would have hoped. I wanted to try to see it through to a better conclusion. “It would have been nice to have something to build on, but unfortunately, I wasn’t given that opportunity. Seven or eight very important players left early in the season as they believed they weren’t going to get contracts for the next year because the money just wasn’t there and that made it a very difficult season for me. “I never believed we were going to be in the same position (as the year before) and I don’t believe we were ever close to being in the same position, even though we finished quite low down. Gritt is now assistant manager at Ebbsfleet, who are flying high in National South, and said: “I’ve got to say I’ve been very lucky, this is my 43rd year in football since I left school. I’ve managed to survive the last 25 years and it’s been a good life to me. Gritt will be thrilled to see Albion in the Premier League and said: “I’m absolutely delighted for them. Chris Hughton is a terrific manager and a terrific person as well. “I’m pleased for him but more than that, I’m pleased for the supporters. They can look back on the last 20 years with a great deal of pride. “They’ve had various promotions and relegations and now are going up into one of the biggest leagues in the world, if not the biggest league in the world. Twenty years ago, you’d never, ever believed they’d get anywhere near it. “I hope I’ve played my little part in helping them eventually get there but it’s taken an awful lot of good people around the club to put them in the position they’re in. “The owner takes a massive amount of credit for the money he has put in but it’s been a on-going project, if you like, for the last 20 years for whoever has been in charge to try to push them up the leagues and, thankfully, Chris is now doing that.